The views expressed in this information product are those of the author and do not necessarily reflect the views of FAO. Rana, K.J. ; Siriwardena, S.; Hasan, M.R. 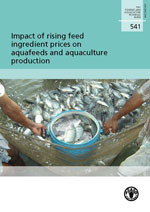 Impact of rising feed ingredient prices on aquafeeds and aquaculture production. FAO Fisheries and Aquaculture Technical Paper. No. 541. Rome, FAO. 2009. 63p. It is now widely recognized that the rising demand for aquatic products will have to be met by aquaculture. The future of aquaculture will depend on how well it meets this challenge. The contribution of aquaculture to total fishery products (excluding plants), globally, has steadily increased from 4 percent in 1970 to 36 percent in 2006 and is continuing to increase. The growing importance of aquaculture in overcoming production limits of capture fisheries can be judged from the fact that China’s 2004 aquaculture production was about 70 percent of its total fisheries production. By 2020, global aquaculture is expected to contribute about 120–130 million tonnes of fish to meet projected demands. The types of species/species groups dominating fed aquaculture production and the recent focus to increase and intensify production of crustaceans, marine finfish, and diadromous fishes, reflects a tendency to increasing reliance on aquafeeds, for their production, and particularly commercial diets. It is, therefore, crucial that aquaculture is sustainable and that the resources required for promoting aquaculture are secured. Key resources required to meet this challenge are aquafeeds and the ingredients used in their production. These resources, together with high transportation costs as a result of costly energy, form the central part of this study. Fed aquaculture relies on a basket of common input ingredients such as soybean, corn, fishmeal, fish oil, rice and wheat, for which it competes in the marketplace with the animal husbandry sector as well as with use for direct human consumption. Many of these key ingredients traditionally used in recipes for commercial or on-farm aquaculture feeds are internationally traded commodities. Therefore, aquafeed production is also subjected to any common global market shocks and volatility. Since 2005, the basket commodity price index (CPI) rose by about 50 percent and the prices of soybean meal, fishmeal, corn and wheat rose by 67, 55, 284, 225 and 180 percent, respectively. Similarly, the cost of major oils used in the aquafeed industry has increased by up to 250 percent. The aquaculture industry is, therefore, not immune to this global phenomenon and the major concern is how it will impact aquaculture. Specifically, smallholders and rural farmers may particularly be susceptible to these global changes and the fallout may further contribute to their poverty and vulnerability. Considering such developments, this technical review evaluates the underlying reasons for the recent dramatic rise in prices of these commodities used in aquafeed production and its consequences for the aquafeed industry and, in particular, on demand and expectations from aquaculture in securing current and future fish supplies. This technical paper also discusses issues related to availability of and access to land and water resources, and the impact of other sectors using these resources on the direction of aquaculture both in terms of species produced and the production systems. In the light of probable increase in competition for land and water in many aquaculture producing countries in Asia, there will inevitably be increasing pressure to intensify aquaculture productivity through the use of more commercial feeds than farm-made feeds. Urbanization has influenced both the level and distribution of income and dietary habits which are driving upwards the demand for high-value fish species with significant implications for feed supplies. Due to the increasing prices of ingredients, aquafeed prices, especially the prices of compound aquafeeds, may increase further and a shortfall in the local supplies will compel importation of aquafeeds. Of the ingredients, fishmeal and fish oil are highly favoured for aquafeeds and aquafeed production is under increasing pressure due to limited supplies and increasing price of fishmeal and fish oil. This review also outlines initiatives that are searching for substitutes for fishmeal and fish oil so as to position the industry to meet the challenge of securing aquafeed for sustaining aquaculture. To regulate the rising commodity prices would require governmental interventions. A brief overview of coping strategies to strengthen national capacity to address the issue of aquafeed supply and to mitigate rising prices of aquafeed ingredient is given. These strategies include policies, research and private sector and farmers’ initiatives.